Last week I said that the Knicks SHOULD go 3-1 in their next FOUR games to remain in contention for the Playoffs, and they did EXACTLY what they needed to do. They beat up on teams that are NOT VERY GOOD, and even though they LOST to one of the worst teams in the NBA, they are now TIED for the SIXTH seed in the Eastern Conference. The Knicks took ADVANTAGE of a SOFT schedule this week, but it is going to get tougher SOON and it will be interesting to see how they respond to the PRESSURE on the ROAD. The Knicks played the Grizzlies at HOME last Wednesday and really dominated and WON easily. It was the first game back for Kristaps Porzingis following his ankle injury and he was a little rusty, but the offense was CARRIED by Courtney Lee, who had season HIGH TWENTY FOUR points to lead the Knicks to victory. The Knicks traveled to Chicago to take on the lowly Bulls on Saturday Night in a game they should have WON in a BLOW OUT, but LOST by TWO points. Porzingis led the team in scoring that night, but the INJURY to Enes Kanter was evident in that game. Kanter is one of the BEST players on the team and IF he is not healthy, then the whole team has some STRUGGLES, so the Knicks need to get Kanter HEALTHY by the time their schedule gets difficult again. The Knicks took on the Hawks on Sunday at HOME and they WON that game thanks in large part due to HUGE offensive contributions from Porzingis and Doug McDermott. This was the highest scoring game in the SHORT Knicks career for McDermott. who needs to become a VIABLE option for the Knicks on offense. The Hawks currently have the WORST record in the NBA, so the Knicks HAD to win that game at HOME. Even though it was NOT pretty, the Knicks got the job DONE and WON the game. The MARQUEE game of this week took place last night at Madison Square Garden between the two most POPULAR NBA franchises, the Knicks and the Los Angeles Lakers. Lavar Ball, father of Lakers’ rookie Lonzo Ball, who has been causing a FIRESTORM in the media regarding the popularity of his THREE sons was in attendance at the Garden. Both teams are REBUILDING right now and probably will NOT make the Playoffs this season, but the juices were FLOWING at the Garden last night. If facing the Lakers did not get the juices FLOWING for Porzingis, he had extra motivation off the court. Jen Selter, a famous Instagram model and Porzingis had been mingling on the internet for quite some days until both caused a FIRESTORM yesterday when Selter was sitting in the Front row right behind the Ball family. In order to impress Selter, Porzingis put up a stat line that had NEVER been done before in the HISTORY of the NBA and the Knicks WON the game in overtime. Porzingis finished with THIRTY SEVEN points, FIVE blocks, and FIVE three pointers, something that had never been done before in the NBA. LATE in the game, the Knicks get big contributions from Michael Beasley, who was a GREAT offensive player this week and rookie Frank Ntilikina, who is turning out to be a great defender. 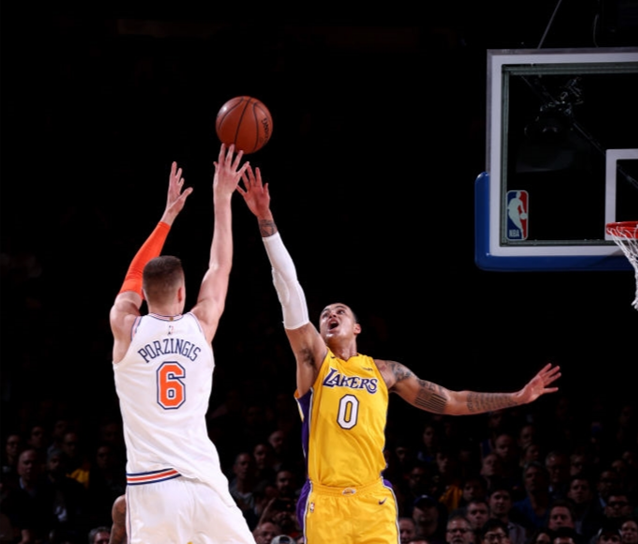 The game was a NAIL BITER for the Knicks, but they got the job DONE and even though the Lakers are not good right now, it was a BIG win for the Knicks to BOOST their confidence for the rest of the season. The Knicks have had defensive ISSUES all season LONG and they need to get FIXED IMMEDIATELY, there were times last night when the Lakers were just WALKING to the basket and keeping the game close and FORCING overtime. IF this team can play GOOD, not GREAT defense then we can start DREAMING about the Playoffs for this team. The coaching staff HAS to figure out what is wrong on the defensive side of the ball and FIX it sooner rather than later. One person that has not been BAD on defense is Ntilikina, who is looking like the point guard the Knicks DESPERATELY need. Jarrett Jack has not played BAD this season as the STARTING point guard, but he is just a placeholder until Ntilikina is ready to TAKEOVER. Ntilikina is GREAT on defense, but needs to be more AGGRESSIVE on offense and for the little parts of the game that he has been AGGRESSIVE, the Knicks have had positive results, like LATE in the game last night. Ntilikina can be a STAR in the NBA if continues to progress the way he has been thus far this season. The Knicks have been really GOOD contributions from the VETERANS on the team to complement Porzingis. Veterans like Lee, Beasley, Kanter, and McDermott have had ONE or TWO GREAT offensive nights, but they have not been CONSISTENT, which forces Porzingis to do TOO MUCH. Despite THIRTY SEVEN points from Porzingis last night, the Knicks BARELY won the game in overtime. The Knicks NEED to find a #2 option behind Porzingis until Tim Hardaway Jr. returns from his leg INJURY. The Knicks have THREE games this week, TWO of which are on the ROAD, and the lone HOME game this week will be the RETURN of Carmelo Anthony to New York after being traded to the Thunder in the off season. The juices will be HIGH for the Knicks for the game against the Thunder on Saturday Night, in a game that will ALSO be emotional for the Thunder. The Knicks take on cross town RIVALS, the Brooklyn Nets tomorrow night and travel to Charlotte to face the Hornets on Monday Night as the two ROAD games this week. The Knicks NEED to win TWO games this week to keep pace in the Eastern Conference and remain in CONTENTION for the Playoffs. That was the look at the Knicks RIGHT NOW, check back NEXT WEEK to see an UPDATED look of the Knicks.